Why should people buy my books? And why do I feel such overwhelming anger when they don’t? The answer no doubt lies deeply buried in the most basic infantile needs for unconditional love and acceptance. In my new book on maximizing creativity, I plan to delve into the research surrounding these issues, but today I simply feel the urge to vent. Last Sunday, following the service, my church held a fund-raising crafts fair, and I had a full table to show and sell my books. The early December timing was ideal, I figured. People would be in the throes of holiday shopping, and I’d priced my books to sell: $10 for a single book, with deeper discounts for more than one. Ten per cent of sales would go to FUUSA, the First Unitarian Universalist Society of Albany, thus providing an added incentive for people to feel proud of their generosity, or so I naively imagined. The results were underwhelming. True, I sold a few books, so my efforts were moderately worthwhile, and I would have been there for coffee hour anyway. But I spent half my haul on infinity neck warmers and ginger cookies from other vendors. The annual event is a good place to pick up on stocking stuffers. Books would fall nicely into this category, you’d think, but apparently not. There was a brisk sale in homemade $13 pies and soups. People love stuffing their faces, but reading? Not so much. I’ve blogged about this problem before. People tell me it comes with the territory and that I should get over it, and I’ve seen a similar phenomenon at conferences like ThrillerFest and Bouchercon, where people queue up in long lines for a few well-known authors while the majority sit forlornly ignored, doing their best to put on friendly, welcoming expressions as they hand out book marks, post cards and candy. I’m as guilty as anyone in passing them by—I already own far too many books, and I can’t afford to buy many more. Those are excuses I frequently hear from people bypassing my table, and they’re valid ones. I’m especially sympathetic to those who plead poverty, and I admire them for their candor, especially at a place like FUUSA, where the majority of congregants are comfortably well-heeled. It’s the ones who are loaded who bug me—people whom I’ve known for years, who can afford to jet around the world to exotic vacation spots yet never consider supporting a struggling local author. 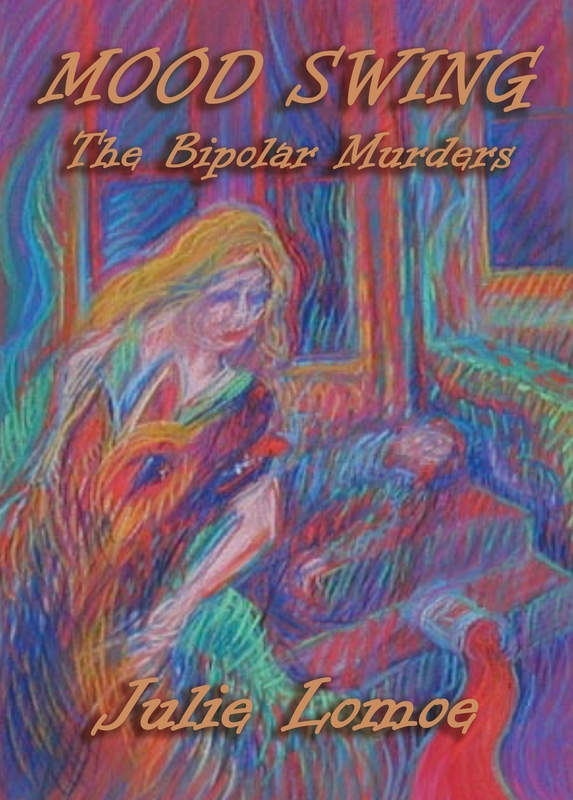 I first self-published Mood Swing: The Bipolar Murders a decade ago, and Eldercide a couple of years later. My vampire soap opera thriller, Hope Dawns Eternal, came out last year. This year I reissued my first two in new editions, so the three books make a nice matched set. Over the years, quite a few FUUSAns have bought my books, but the vast majority haven’t. On Sunday I asked a friend if she’d ever bought any of my books, and she admitted she hadn’t. “I never read novels,” she said. Fair enough, so I suggested if she might consider buying any as presents for friends or family who might feel differently. She gave a noncommittal shrug and turned away. Yesterday some friends from my Nia class at the YMCA met at Panera’s for lunch. I was ranting rather profanely to Richele Corbo, our wonderful instructor, about my marketing problems. She’s not fond of marketing either, but she’s more objective about it. She’s passionate about Nia, which combines nine forms of dance, martial arts and body work, and she talks it up to people who might be interested, but many refuse. Some feel it’s too strenuous, others that it’s not strenuous enough, or too esoteric. One woman told her “Sorry, but it’s a little too ‘kumbaya’ for me.” She doesn’t take the rejections personally, accepting that Nia’s just not for everybody, and she encouraged me to adopt the same attitude. But Richele didn’t invent Nia,* so it’s easier for her to be objective. My novels, on the other hand, are deeply personal, and although they’re not autobiographical, the first two draw on life experiences that affected me profoundly, so it’s hard not to feel the pain of rejection. I used to feel the same about my paintings, but I’m no longer so personally invested in them, since they’re now a part of my past. On Sunday I brought two small oils—one a vase of tulips, the other a view of Lake George—to fill out my table display. ** I didn’t expect to sell them, since they’re priced at over $300, but lots of people admired them. Strangely, many said they hadn’t realized I was a painter, even though I’ve shown those paintings at FUUSA in a solo show and a couple of group exhibitions. Apparently they had never bothered to look at the walls. But enough kvetching. If you’ve read this far, you’re probably in agreement with those who tell me to “get over it.” But I’ve got a lot more to say in future posts—including thoughts about a local reporter who was writing up until his death at 84, and about what L. Ron Hubbard, the founder of Scientology, had to say about the importance of admiration. Please share this post, subscribe, and leave comments so I’ll know you’re out there. Even more importantly, please buy my books! You can’t possibly be finished with Christmas shopping yet. You can order them from Amazon, or I can inscribe them personally and mail or deliver them to you in time for the holidays. To discuss these options, contact me at julielomoe@gmail.com. *To learn more about Nia, visit www.nianow.com. Here you can also find a registry of Nia teachers in your area, including Richele. **The colors in my oil paintings are much more vibrant than they appear in this photo. I also did the illustrations for the original covers of Mood Swing and Eldercide, which are visible behind the new editions with their wonderful covers by Kim Killion. I still have a few copies of the original editions, although they’re no longer available on line. My stylistic influences include Munch, Van Gogh, the Fauves and the German Expressionists. Nursing home placement – another form of elder abuse? Elder abuse takes many forms. Nursing home placement may be a humane solution, but to many elders it feels like involuntary confinement. I was moved by Jean Henry Mead’s comment on my last post, about the 98-year-old woman who jumped to her death from a nursing home window. My own father experienced a similar sense of abandonment when my stepmother abruptly placed him in a nursing home without consulting the rest of the family. I was in New York City in my ninth month of pregnancy when I got his furious call from Michigan. She’d betrayed him, he said, and he wanted a divorce. Although he’d suffered from mild dementia, the outrage triggered total lucidity. I’m also convinced it killed him, because a cardiac event – what doctors sometimes call a sympathetic storm – caused his death early the next morning, before my husband and I could help make alternate arrangements. The trilling of the cell phone was so subtle that the sound carried barely twenty feet from shore, harmonizing with the chirping of the sparrows and the soft cooing of the mourning doves. 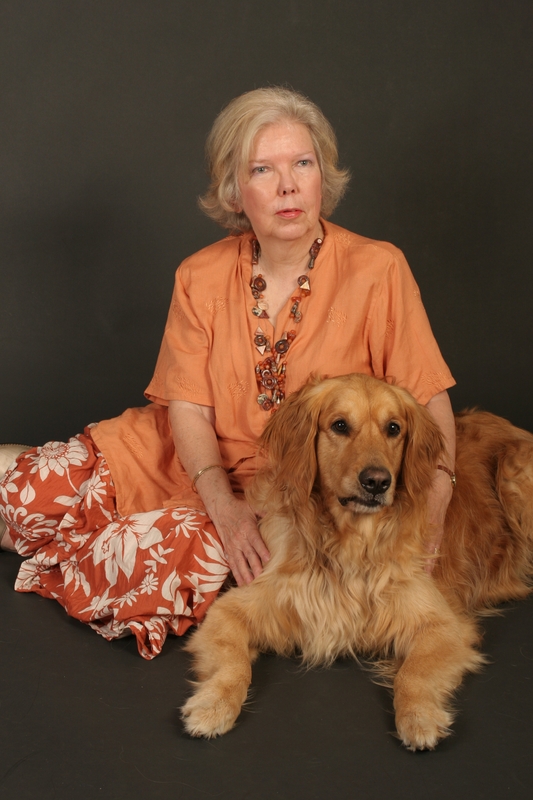 If not for her dog Freia, Claire Lindstrom would have missed it entirely, but the big blond Labradoodle was dancing on the dock, wagging happily as she bounced around the little black instrument of torture. “Good girl!” Claire murmured as she steered the kayak in for a landing. She’d taught the dog this silent pantomime in deference to the neighbors, most of whom didn’t appreciate being stirred from sleep by a salvo of barks, no matter how magnificent the sunrise. Setting down the paddle, Claire grabbed the cell phone and peered at the caller ID. The number was Harriet Gardener’s. A shiver swept over her, despite the rising heat of the early September day. As nursing supervisor for a couple of dozen home care clients, Claire was accustomed to getting calls at all hours of the day and night. Call her compulsive, call her a workaholic, but she’d made it clear to everyone on staff that she wanted to be brought up to speed on anything out of the ordinary, no matter what the hour. Most of the clients at Compassionate Care were elderly, and many were gravely ill. The aides knew better than to leave Claire out of the loop when it came to making judgment calls about the people in their charge. But Harriet Gardener was in excellent health, physically at least. She suffered from mid-stage Alzheimer’s and needed supervision to prevent her wandering away or burning down the house with her absent-minded attempts at cooking. But she was strong, and she rarely came down with so much as a sniffle. For the time being, thanks in large part to her live-in aide Dahlia Douglas, her quality of life was excellent. But inevitably that would change. Although they tried not to show it, the fact that she was fated to endure many years of painfully slow decline, culminating in the eventual loss of all her mental and physical functions, distressed her overwrought family no end. . . .
Halfway across the lawn, she had the cell phone out of the bag, her finger poised over the callback button. She jabbed the button as she set foot on the first step, and the phone was ringing by the time she reached the deck. Just like my father. Claire shivered. She took Dahlia’s report, somehow got through the formalities, hung up. Then, suddenly wobbly, she sank onto a chaise. Nine years ago, on a flawless September morning much like this one, she’d gotten a call from the nursing home where he’d been admitted the day before, suffering from mild dementia. He had gone to bed ostensibly healthy, died sometime in the night. A previously undiagnosed cardiac problem, they said. Or, as Claire always thought of it, a broken heart. He’d been furious when her mother shunted him off to a nursing home against his wishes, vowed to get out if it was the last thing he did. He had fulfilled his vow, although not the way he planned. He shouldn’t have died that way, abandoned and alone in an institutional bed. His death shocked Claire into abandoning graduate school and entering nursing. She found her way into home care, where she could help keep people away from those warehouses for the dying. All these years spent making amends, and now it had happened again. Read the entire first chapter of Eldercide here on my blog. You can order the novel from Amazon or directly from me – see the page on how to order my books for contact information. 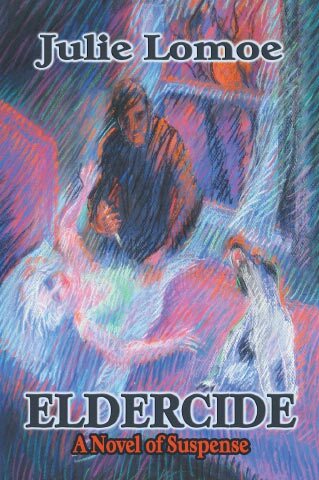 I did the cover illustration for Eldercide – perhaps you can see that Munch is one of my inspirations. A new gallery, the River Front Art Coop, is opening in downtown Troy, and I’m schlepping some of my work down there this afternoon with a view to showing it on consignment even though when it comes to the visual arts, I’m feeling pretty rusty. I did the cover illustrations for both my mystery novels, but aside from a few collages, I’ve neglected what used to be my primary means of artistic expression. Writing is so much speedier. At the computer, my ideas flow from my fingers. Saying it’s effortless would be lying, but for me, it’s a heck of lot easier than painting, and you can say so much more in a shorter time. Writing is cheaper by far. A decent computer and Internet connection, a ream of bright white multipurpose paper from Staples, a new toner cartridge now and then, and I’m good to go. Have you priced art supplies lately? Writing requires less space. In a space six by six feet – that’s 36 square feet – I have my L-shaped computer desk, my file cabinet, my comfy office chair, a little wicker stand that serves as a cat bed, and a picture window with a lake view. In our present home, alas, there’s no space that’s remotely adequate for my needs as a visual artist. If my longing to paint becomes overwhelming, I’ll have to build or rent studio space. Writing enables me to reach more people more affordably. 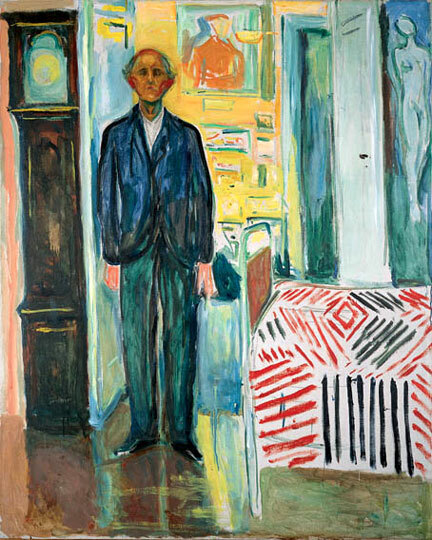 Over the course of decades, I’ve developed a jaundiced view of the art world. One-of-a-kind works of art are luxury items, and few people can afford to buy them. For centuries, the visual arts have been the province of the privileged – commissioned by the church or supported by wealthy patrons. Books, on the other hand, are still relatively affordable. And writing on the Internet, I can reach a potentially limitless audience for free. It feels much more politically correct than hanging my work in a gallery. Nonetheless, those big empty walls at the River Front Art Coop have a powerful allure. The space is magnificent – a high-ceilinged commercial space that reminds me of my old lofts in SoHo, with a view of the Hudson from windows at the back. I miss the camaraderie of the community of artists I knew in New York City, and perhaps the three women starting this gallery, including the stained glass artist Terry Faul, will be able to help fulfill that particular void in my life. So after I publish this post, I’ll get to work unearthing some art work and loading it into my Focus hatchback. I’ll try to shush the inner critic who tells me the work isn’t good enough, subject myself to their scrutiny and see what happens. Who knows, I may be seduced back into the visual arts, at least part-time. If I clean up my office, I might even find space for that new drafting table I haven’t unpacked yet. Wandering the streets of Schenectady during the “Art Attack” on Saturday, evading the pleading eyes of the artists hawking their works throughout the city’s downtown, I felt an overwhelming sense of relief that I wasn’t one of the hundreds who’d signed up for what may become an annual event. I was reminded, too, how writers have it easy compared to visual artists when it comes to displaying our work. It’s not that I wasn’t tempted. When I read the e-mail invitation to display my work at Art Attack, I gave it some serious thought. A chance to display several of my paintings and collages for free in a city-wide festival on the first day of spring, perhaps even to sell them – what’s not to like? Then I reminded myself of the logistics involved – loading my paintings into my trusty Focus hatchback, schlepping them to Schenectady, hanging them and arranging a display area, maybe babysitting them throughout the weekend, then putting the entire process into rewind on Sunday evening. Not worth the hassle, I decided. 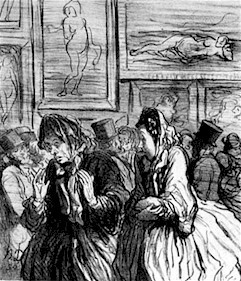 Daumier "This Year Venuses Again"
Five-star Frame and Art, the first venue I visited, was a lovely gallery, with quality work displayed in mini-one-person shows. Damn, I thought – I shouldn’t have blown this off. Maybe next year. Unfortunately, it was all downhill from there. Schenectady’s striking city hall, designed and built during the Depression by McKim, Mead, and White, was temporary home to hundreds of art works in many media – some truly excellent, but the majority mediocre or worse. Artists sat or stood by their works with their game faces on, doing their best to make eye contact and smile. There were plenty of visitors, but there and at the other venues it was obvious that they were out for a leisurely stroll on a gorgeous spring day, and that the art was strictly secondary. I didn’t see any serious discussions of art happening, let alone any sales. I chatted with some of the artists, and learned they’d been advised to stay with their work if possible, since the event offered no insurance coverage. How about you? 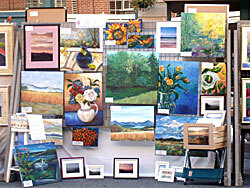 Do you enjoy hanging out at public venues showing and hoping to sell your work? Is it a necessary evil you endure? Or do you bypass it entirely? 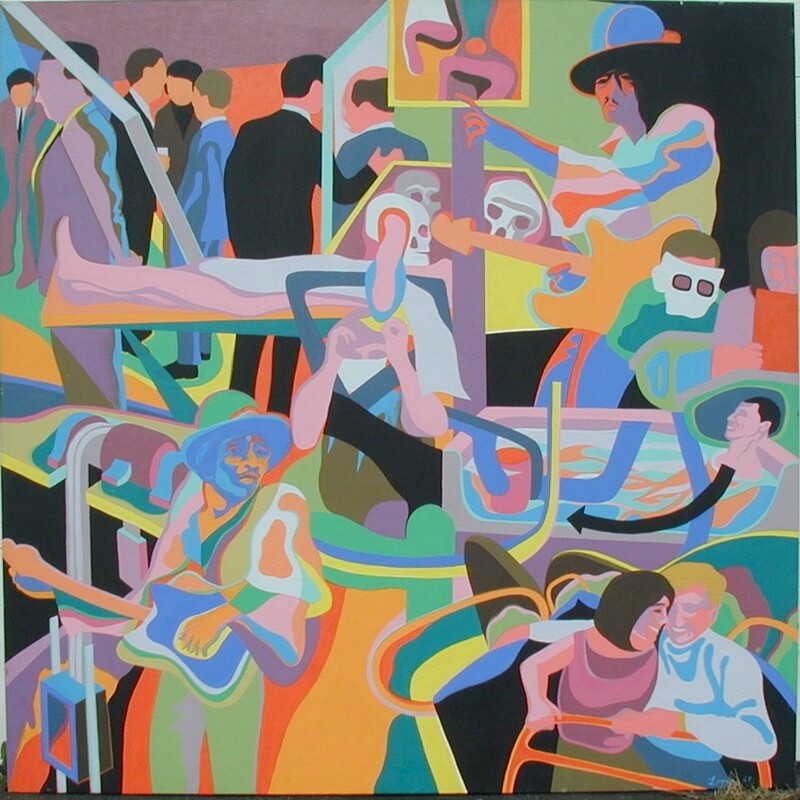 I’ve received lots of positive feedback for my posts about the 1969 Woodstock Festival, where I won a prize for my paintings. The growing sense of community I’m experiencing as I widen my circle of friends on the Internet reminds me in many ways of the spirit of the 60’s. At the height of Flower Power, I was a newly divorced (well, at least amicably separated) woman in my twenties and a pioneer settler in the cast iron district in Lower Manhattan that was becoming known as SoHo. When I renovated my first loft on Broome Street, I put in a minimal bathroom with the cheapest tin shower stall I could find. Incidentally, that loft was diagonally across the street from the one where Heath Ledger died. The articles on his death all described the neighborhood as luxurious and upscale, but it was anything but back then. As I recall, bodily hygiene wasn’t a high priority in the 60’s, for myself and for many others. I won’t go into the gory details, but suffice it to say we got pretty funky. And at the Woodstock Festival, I didn’t get near running water for three days straight. I’m no Marcel Proust, and I don’t have a vivid olfactory memory. People must have smelled pretty ripe, I suppose, but the odor was masked by all the fragrant smoke. Thank heavens no one can smell us when we’re being scintillating online. They can’t see us either, unless we want them to. For the Poisoned Pen Web Con back in October, billed as the first virtual international mystery writers’ conference, authors had the option of doing live video feeds, but luckily I wasn’t up to speed on that particular technology. Some authors who did manage to give a presentation that way may wish they hadn’t – the fish-eye lenses built into their computers were anything but flattering. I wonder if writers in Nebraska or Maine become even more slovenly than I do. I’m fortunate to live in the Capital Region of upstate New York, and there’s lots of live in-person literary and artsy action. I clean up fairly nicely for my age, and I enjoy dressing for success as much as the next woman. I spend much less money on clothes than I used to, though – one of the many advantages of doing most of my socializing online. In a couple of hours, I’ll be leaving for the Albany’s monthly First Night to make the rounds of the galleries. Knowing my husband, he’ll tactfully say, “You’re going to take a bath, aren’t you?” I don’t know why he feels the need for these reminders after 36 years, because I do have a modicum of judgment on hygiene issues. As I sit here at the computer in my upstairs office, looking out at the lake while my two cats stare in tense fascination at the red squirrel using the nearest bare tree as a jungle gym, I realize how lucky I am. I love reminiscing about the 60’s, but given the option, would I want to time-travel back? Not on your life. This post originally appeared in slightly different form on Marvin Wilson’s blog on November 20, 2009. For more about my experiences in the 1960’s, click on the Woodstock category in my blogroll at the right.